Irene Mulryan, one of the midwives at Portiuncula explains the benefits of hypnobirthing. She said, “The aim of the hypnobirthing classes is to prepare mentally for birth, in the context of birth being a normal event and not something to be frightened of. Often the name ‘hypnobirthing’ conjures up images of being hypnotised but this is not the case. It is a strategy with numerous coping tools which helps couples to understand and appreciate the physiological process of birth. It enables women to prepare to give birth by the use of breathing and relaxation techniques, massage and positive visualisations. “Women and their birth partners who attended the hypnobirthing classes report feeling more informed and empowered after participating in the class. Birthing partners felt more involved and in partnership with the mother and the care givers. Having used hypnobirthing, women also reported feeling calmer and more in control during labour – no matter what type of birth they had. Maternity Department Staff at Portiuncula University Hospital where hynobirthing classes are available for mothers and birthing partners. 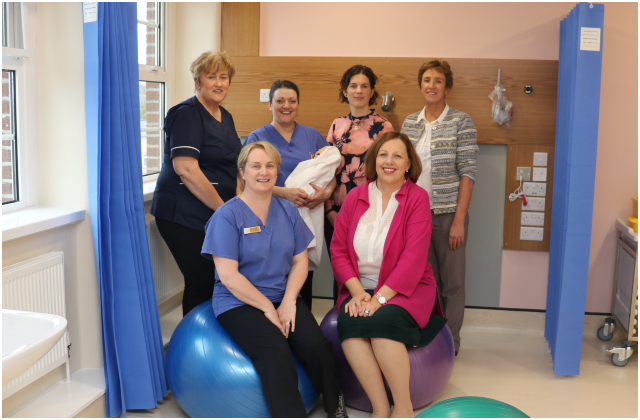 Standing, from left: Anne Murray, Clinical Midwife Specialist; Geraldine Guinan, Midwife; Irene Mulryan, Interim Clinical Midwife Manager 2 and Mary Burke, Clinical Nurse Manager 3. Seated from left: Carmel Cassidy, Midwife and Aisling Dixon, Clinical Midwife Manager 2.